Community website by MBC/Ernest Abrams. Call 808-739-9797 for advertising/sponsorship. Community website by MBC/Ernest Abrams. Call 808-739-9797 for advertising/sponsorship. The public is invited to attend the 11th annual Art at the Capitol on Friday, April 5 from 5 p.m. to 7 p.m. at the State Capitol.At this festive and free event, visitors are welcome to view the works of public art that are displayed in the offices at the State Capitol. The theme this year, "The Capitol is Art," reflects on the art aspects of the building and focuses on the 50th Anniversary of the Capitol itself. 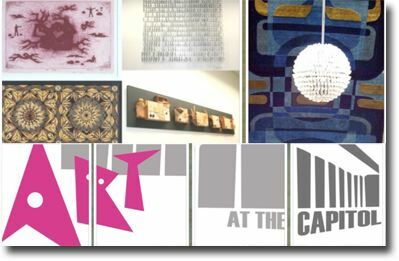 Art at the Capitol begins with the opening program at 4:30 p.m. in conference room 329 that includes an introduction of artists and special guests. Self-guided tours start at 5 p.m. and the galleries of the Senate and House will be open to view videos about various art objects at the Capitol as well as about the building of the Capitol in 1969. Throughout the evening, music will be performed by the Hawai‘i Youth Symphony. The program ends at 7 p.m., however the public is invited to continue the celebration of local art and music just across the street at the Hawai‘i State Art Museum, which will be open until 9 p.m.
Art at the Capitol was begun by Senator Brian Taniguchi 11 years ago and developed as an extension of the "Art in Public Places" program sponsored by the State Foundation on Culture and the Arts. Great videos to learn about Hawaiian art & culture. Come to "Art at the Capitol" on March 6, 2015 form 4:30-7 pm to view over 500 works of art displayed in the offices our state lawmakers and in the executive offices. Great videos to learn about Hawaiian art & culture. Come to "Art at the Capitol" on April 4, 2014 form 5-7 pm to view over 460 works of art displayed in the offices our state lawmakers and in the executive offices. Come to "Art at the Capitol" on March 2, 2012 form 5-7 pm to view over 460 works of art displayed in the offices our state lawmakers and in the executive offices. The Hawai'i State Art Museum is dedicated to presenting the largest and finest collection of works by Hawai'i artists that celebrate the diverse artistic and cultural legacy of Hawaii. Learn about First Friday Hawaii.Com, its Web site creator and why it is all free. Learn about First Friday Honolulu Gallery Walk in downtown Honolulu / Chinatown area. Keep up with the latest news from the First Friday community - special events, calendars, Downtown/Chinatown news, art news and much more! Check out upcoming exhibits, shows and events for the next First Friday. View/Join First Friday Facebook fan page. Our mission is to tweet you hot tips and money savers related to First Friday Art Gallery Walk and the art community. Populated By MBC Website Tools. Advertise On First Friday Hawaii.com And Reach Thousands! Copyright© 2006 - 2019 FirstFridayHawaii.com. All rights reserved.